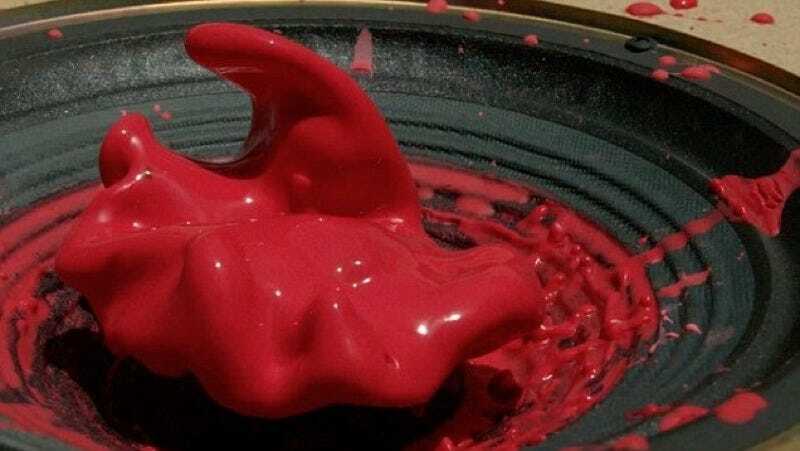 Has the Mystery Behind This Non-Newtonian Fluid Been Solved at Last? Image: Gavin Free and Daniel Gruchy, a.k.a. the Slo Mo Guys. Mixing corn starch and water makes for a crowd-pleasing staple of science demos. The resulting substance looks like a liquid, but hardens instantly when you punch it—in fact, it’s possible to run across a pool of the stuff. Now physicists think they’ve figured out just what’s going on when this unusual material switches from a liquid to a solid, hopefully ending a long-running debate. They described their findings in a new paper in Physical Review Letters. The mixture goes by many names, but the most common one is “oobleck,” a nod to the classic Dr. Seuss story, Bartholomew and the Oobleck. It’s really simple to make your own. Just combine two cups of corn starch—add three drops of green food coloring if you want that snot-like Seuss effect—and gradually mix in enough water to create a mixture that resembles pancake batter (usually about equal parts starch and water). What Happens When You Shoot a Golf Ball at a Balloon Filled with Non-Newtonian Fluid? The friction arises because a flowing liquid is essentially a series of layers sliding past one another. The faster one layer slides over another, the more resistance there is, and the slower one layer slides over another, the less resistance there is. Anyone who’s ever stuck their arm out of the window of a moving car can attest that there is more air resistance the faster the car is moving (air is technically a fluid). That’s the basic principle. But the world is not an ideal place.... In Newton’s ideal fluid, the viscosity is largely dependent on temperature and pressure: water will continue to flow — i.e., act like water — regardless of other forces acting upon it, such as being stirred or mixed. In a non-Newtonian fluid [like oobleck], the viscosity changes in response to an applied strain or shearing force, thereby straddling the boundary between liquid and solid behavior. That’s the big-picture explanation, but physicists have been arguing for decades about precisely what’s going on at the small scale, because experiments and computer modeling studies haven’t agreed. From a physics standpoint, we’re talking about microscopic particles suspended in liquid (colloids). On one side are physicists who think that friction between those suspended micro particles lock them in place to resist flowing like a liquid. So who is right? Physicists at Georgetown University and the National Institute of Standards and Technology think they have the answer: both sides are right. The two competing theories are actually complementary. So it’s kind of a win-win for physics. “This transition demonstrates that shear thickening is driven primarily by frictional contacts, with hydrodynamic forces playing a supporting role at lower concentrations of particles, when mixtures are less dense,” lead author John Royer of NIST said in a statement. Shear-thickening fluids are already being used on prototype bullet-proof vests and sporting equipment, because their sensitivity to impact means they can better absorb the energy of a high-velocity projectile or hard impact, while still being flexible enough to wear comfortably. The US and Canadian skiers in the 2006 Winter Olympics wore a similar form of “smart armor” manufactured by a British company called d3o Labs.